Have you ever been to Mardi Gras? I have not but it is one of several trips on my bucket list! It will happen someday, I am determined! Until then I will have to settle for celebrating at home. No Mardi Gras shindig would be complete without a menu featuring the vibrant, distinctive tastes of New Orleans. There are so many tantalizing recipes out there that would be perfect for a Mardi Gras bash, but I have narrowed it down to my ten favorites. Gumbo Dip - Yes, you read that correctly. I did a double take myself when I first stumbled onto this recipe. Who would have thought of turning gumbo into a dip? Whoever it was is clearly a genius! This recipe combines all the fresh flavor of a tasty gumbo with cream cheese to create a tasty, one of a kind appetizer. You will not be sorry you tried this one! Muffuletta Pinwheels - This is another recipe that takes a traditional taste of New Orleans and puts a new spin on it. In this case it's one of my favorite things in the world, the muffuletta sandwich. Instead of the usual sandwich, this recipe takes all those yummy flavors and turns them into appetizer pinwheels. These are dangerous in that they are habit forming. Not only are they delicious, they also look amazing on an appetizer tray. I love food that's as pretty as it is tasty. Easy Chicken and Sausage Jambalaya - Jambalaya is one of my favorite dishes, but I have only made it a handful of times because I thought it was a difficult dish to get right. Wrong! Enter this recipe I just discovered that makes it easy. Is there anything in the world better than yummy and easy? I think not! New Orleans BBQ Shrimp - This recipe has been a family favorite for years now. I adore shrimp, but was afraid to cook it for a long time. I am so glad I ditched that fear and perfected this dish. If you like shrimp, give this one a try. It's a party for your taste buds! Creole Green Beans - Side dishes that aren't the same old thing make my family happy. This dish is easy to throw together, quick to cook, and incredibly flavorful. I wouldn't have thought about doing green beans this way on my own, so am so happy I came across this great recipe. You probably have everything you need to stir up a batch in your kitchen right now! It's a great side for any day of the week, but fits great on a Mardi Gras menu. Roasted Squash + Parmesan - Where do I even start with this recipe? It's simple, reasonably good for you, delicious, and beautiful. 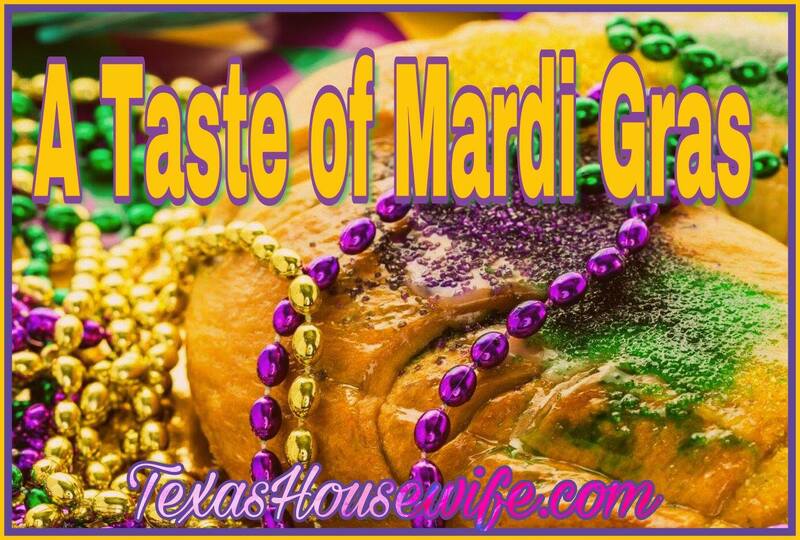 I would serve this any day, but for Mardi Gras it definitely delivers a punch of all the right vibrant colors! Check it out for yourself and you'll see what I mean. This one is a keeper, I promise! Mardi Gras Kiss Cocktail - Who doesn't like a kiss? Just kidding, but this cocktail sure is tasty treat on your lips. Rum and pineapple combine to make a drink that hits the spot. Easy to make and oh so good, this one is likely to become a party favorite for us. Non-alcoholic Mardi Gras Punch - This stuff will please old and young alike. It's pretty and sweet, making it a perfect addition to your Fat Tuesday celebrations! King Bundt Cake - When it comes to dessert for Mardi Gras, what else would you have? My Little Miss loves King cake so much that I decided learning how to make one was the smartest move in the long run. This one has amazing filling. Grandma's Old-Fashioned Bread Pudding with Vanilla Sauce - This isn't my grandma's, but it's still an amazing recipe. Bread pudding is classic New Orleans and this recipe delivers amazing flavor. If you love bread pudding, this is a winner!